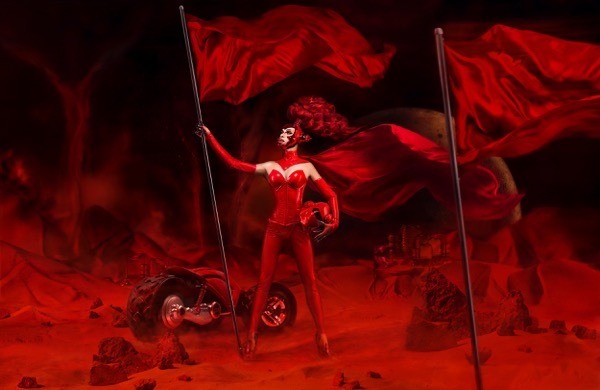 Described as a an intergalactic adventure in photo making, the conceptual photography of Robert Earp focuses on the ‘surreal realness’ of transgendering with his current exhibition. Named after Earp’s ‘divalicious’ artist/collaborator/muse – and featuring the sometimes-salacious and ever-sassy wordplay of Ian Buckland – the true story of Venus Virgin Tomarz is told in hyper-colourful composite photographs that recall the sci-fi kitsch of yesteryear. Think Barbarella-meets-Flash Gordon-meets-Dune. Entire galaxy and epic encounters have been created in minute detail, using everyday household items as their building blocks. In Venus Virgin Tomarz’s universe, the stars are bicarbonate soda, mixed spices or a sprinkling of chalk dust; the moon is a swirling pour of beer; a Kitchen aid blender whips up tornadoes; and the flesh of alien robots comes from the fish in Earp’s tank. Playtime with Pluto. © Robert Earp. Nothing is as it appears but, once you metaphorically scratch the surface, these very analogue methods come together to pose profound futuristic questions that affect us all (whether goddesses or otherwise). Where are we going and how are we getting there? Will we be able to accept each other in whatever guise we appear? Mars Triumph. © Robert Earp. Clash of Two Worlds. © Robert Earp. Extraordinary images of late 19th and early 20th century Sydney in transition, captured by the Macpherson family over a 50-year period. An ancient rock shelter in remote Arnhem Land decorated with complex x-ray figures and naturalistic animals is one of a number of extraordinary Indigenous sites featured in this exhibition of work by acclaimed Melbourne photographer, John Gollings. Melbourne photojournalist Darrian Traynor presents ‘Occupation Displacement’ - a selection of uncommissioned and self-funded work made over three years focusing on stories of people affected by conflict in the Middle East. In this boutique workshop, John Gollings will demonstrate photographic techniques and technologies used to document the architectural form.